Thomas Pontoppidan in mid-jump (Credits: Thomas Pedersen/Copenhagen Suborbitals). 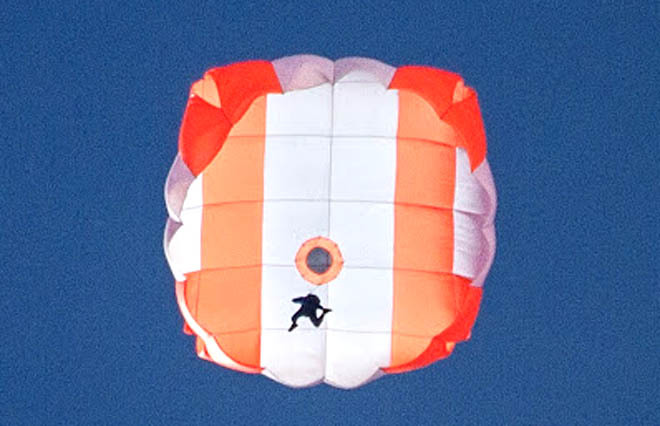 On the one year anniversary of Copenhagen Suborbitals’ June 3, 2011 test launch of their HEAT1X rocket carrying the Tycho-Brahe spacecraft, the company achieved another success: Thomas Pontoppidan jumped from an altitude of 2 km with the Tycho space capsule parachute strapped to his back. The chute deployed as anticipated and Pontoppidan landed safely. “The irony in all this is that you are not allowed to throw any ballast out from a plane to test parachutes – only if that ballast is a living person. Rules are weird that way,” commented Suborbitals founder Kristian von Bengtson in his blog. Contrary to von Bengtson’s earlier proposal, they did not push Copenhagen Suborbital staffer Mads Stenfatt out of the plane, instead relying on an experienced jumper with the help of Nordjysk Faldskærmsklub (NJFK). Copenhagen Suborbitals was founded in 2008 by von Bengtson and Peter Madsen with the goal of launching themselves into space. The company is making steady progress on its “do it yourself” construction of the Tycho Deep Space Capsule. This spring has seen significant advances on the made at home parachute system for Tycho. In March, the parachute was drop tested from an 89 m gantry crane. The test was successful, but the drop was too short to test the slider mechanism which is used to control the opening speed of the canopy. 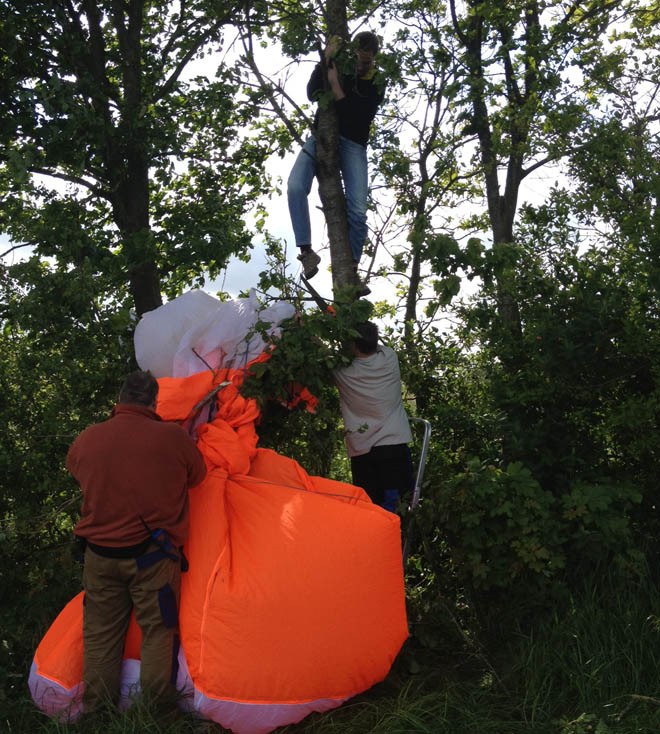 Tycho's parachute was recovered from a tree 4 km away after its release (Credits: Mads Stenfatt/Copenhagen Suborbitals). That slider test has now taken place with Pontoppidan’s jump from a Cessna 182. Four jumps had originally been planned, but the parachute landed in a tree after being released from a 1.5 km altitude in the first jump. The chute sustained minor damage and the remainder of the tests had to be cancelled. The first jump used a slow slider, with a 12 second deployment time, since a slower deployment imparts less strain to the equipment and cargo – in this case, the jumper. There is no word on whether or when the remainder of the tests will be rescheduled.